At Disney, we love Halloween! Whether you’re planning a Halloween party or taking the kids trick or treating around the neighborhood or at the local mall, it’s all exciting. But if you want to create some really special Halloween memories, we suggest sharing the fun of Mickey’s Not-So-Scary Halloween Party at Magic Kingdom® Park at Walt Disney World® Resort. For more than 20 years, Disney’s spooktacular celebration has been delighting Guests of all ages with more to see, do and experience than you can shake a broomstick at. Here’s what you can expect—along with a few tips for making the most of your visit. 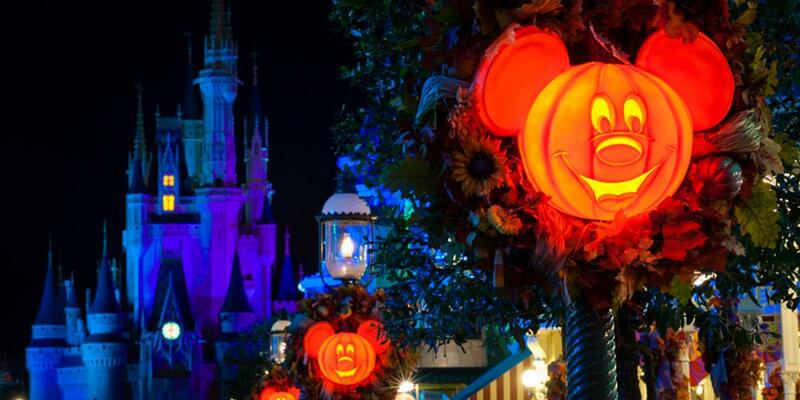 Mickey’s Not-So-Scary Halloween Party has grown in popularity every year. This year it runs from September 2 to October 31 during select nights. The event is separately ticketed and tickets sell out early. (You know where we’re going with this.) Make your plans and purchase your party tickets way in advance. For more information, visit MickeyHalloween.com. Reminder – Disney Visa® Cardmembers can redeem their Disney Dream Reward Dollars® toward tickets.1 Not yet a Cardmember? Click here to see how having a card can turn your everyday purchases into frightfully great Disney rewards. When you arrive at the party (wearing your amazing Disney Character costumes, of course), grab a Halloween Guide Map to 20 specially-marked treat locations around the Park. Don’t fret if you or someone in your family has an allergy, because you can get chocolate that’s gluten and nut free. They even have sugar-free candy. Isn’t it terrific how those Disney folks think of everything? 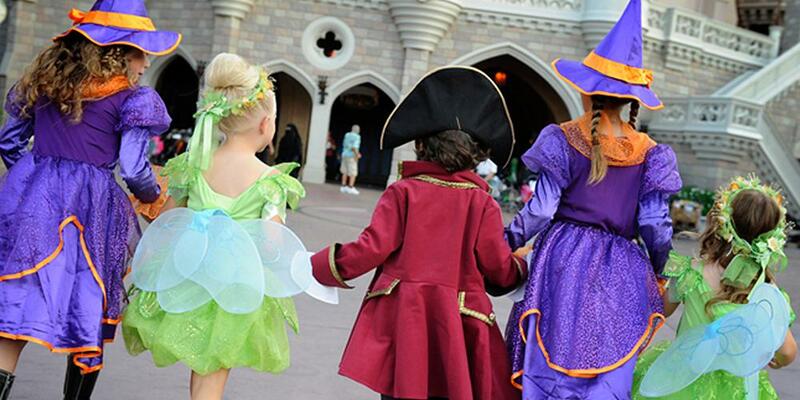 Wondering what to wear when trick-or-treating at the Park? Check out this handy costume guide for a list of tips. Want a good dinner before you fill up on treats? For the first time, Be Our Guest, Cinderella’s Royal Table and Crystal Palace are open for dining during the event. Again, don’t dally. These restaurants are so popular you’ll want to reserve tables early. Visit MickeyHalloween.com or call 1-407-W-DISNEY to book your table. Filling those bags with treats is fun, but be sure to take a break from trick or treating to catch this parade. It’s amazing! The fun begins with a hair-raising ride by the Headless Horseman followed by a dozen ghoulishly great floats and more than 120 performers and Characters— including 11 who only come out to play in the Park at this time of year. We love the gravediggers whose shovels throw actual sparks. Remember those mischievous Sanderson Sisters from Disney’s “Hocus Pocus?” Well, they’re baaaaaaaack. They return to the mortal world for one night during the Halloween season and use their magic to throw the Best. Evil. Halloween Party. Ever. Check your Park guide for dates and times. Join the Haunted Mansion Ghost Host for fiendish fireworks and Disney tunes with a wicked twist. You’ll shiver with delight as creepy colors crawl over Cinderella Castle and some of Disney’s most notorious villains try to steal the show. Want a special place to enjoy the spectacle? 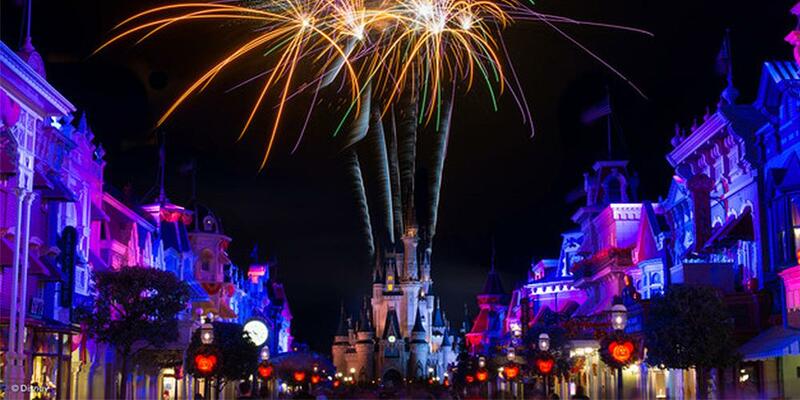 Consider the Happy Hallowishes Dessert Premium Package, which offers a unique viewing location along with wickedly lavish desserts. Visit MickeyHalloween.com or call 1-407-W-DISNEY to make reservations. Halloween may seem far off, but now’s the time to plan your trip. Pack your costumes, tune up your broomstick and head to Magic Kingdom® Park at Walt Disney World® Resort for a howling good time at Mickey’s Not-So-Scary Halloween Party. The season of frightful fun is about to begin.